We are a small nursery in Central New York, 18 miles southwest of Syracuse. 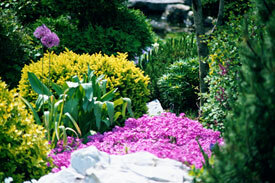 Our interest is in growing new and hard to find conifers, perennials, shrubs, and trees. We have a special interest in Japanese maples with over 500 varieties available and we are adding to the collection every year. Our maples are grown from grafts that are produced at our nursery. A background in the production field of the nursery trade for 20 years enables us to produce high-quality plants with the utmost care.